Sunday, August 28th, 2016 at 12:36pm. 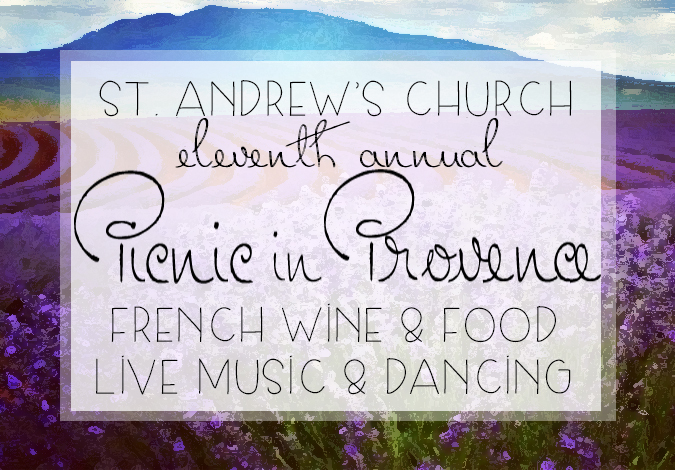 Taking place this afternoon at St. Andrew’s Episcopal Church in Lake Worth is the 11th Annual “Picnic in Provence” event. The event has been a smash hit in the past and is sure to deliver the same whimsical feel again today. Join the staff and members of St. Andrews Episcopal Church this afternoon at 4pm for wine tastings, delicious French delicacies, live music and dancing in the warm summer air. The Provencal themed affair will feature white, rosé and red wine from all over France available for you to taste and try. There will be live French music playing, dancing and mingling, a perfect way to spend you Sunday evening with family or friends.